In 1894 the publisher of the book that inspired this dramatic audio rewarded Florence Kingsley with $1,000 for writing a story that would set a child's heart on fire for Jesus Christ. In six weeks the demand was so great, they printed 200,000 additional copies! 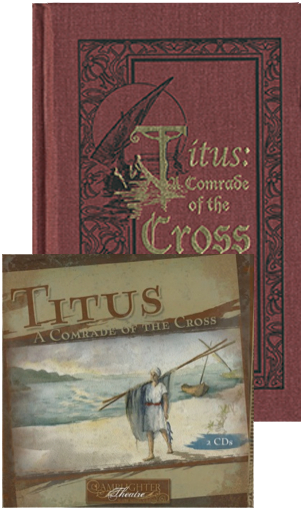 This award-winning entry, Titus: A Comrade of the Cross, is provocative, full of suspense and drama. 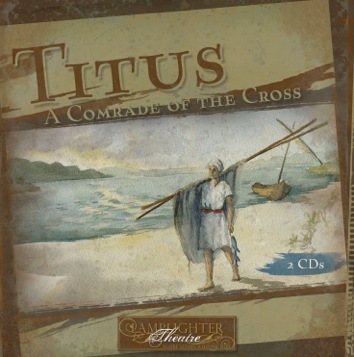 The story of Titus and his crippled brother climaxes at the foot of the cross, where the real hero is proclaimed. The most compelling moment is saved until the very end. It will take your breath away. This one is probably my favorite so far. We were riveted as we listened during a long drive. We will NEVER look at the crucifixion the same way again. It was so moving. I drove with tears that day. EXCELLENT! We listen to your audiobooks when traveling. Really enjoyed this one!!! Great job!! From Maren M. of Owosso, Michigan on 10/7/2018 . What a beautiful story of redemption! I sometimes have a hard time putting myself "inside" of Bible stories, but this audio makes me feel like I am hanging right there next to the thief on the cross. Although it is a fictionalized story, it still sticks very close the the true story of Jesus's life and crucifixion. Thank you, Lamplighter, for another great audio drama! From Andy Callaham of Belton, South Carolina on 3/26/2018 . From Anonymous of Sydney Australia, Australia on 11/21/2017 . My children love listening to the audio stories however, after listening to this one, they became confused. Bible names were used so they began to assosiate the audio characters with the true characters in the Bible but it wasn't the same people like Stephen and Titus. In my opinion, it's not good to mix the Bible with fiction it confuses it with the real thing.